Companies are increasingly adopting sustainable practices, energy-efficient lighting and reusable products to reduce their carbon footprints and save costs. Their efforts benefit meeting planners considering the Washington metropolitan area, which is a destination that boasts multiple key industries and shares a common vision for a sustainable planet as the world’s first LEED Platinum city according to the U.S. Green Building Council. Check out the variety of sustainable spaces the city boasts in each quadrant. Right Proper Brewing Company is run completely on solar power, producing almost all of the company’s consumed electricity. As part of their leadership’s focus on the local community and their Brookland neighbors, the independent craft brewery wanted to minimize its environmental impact. For a brewery, this means returning to the roots of brewing. Right Proper proudly says “our beer starts and ends with the sun.” The company also uses LED lights in the tasting rooms and production facilities and gives spent grain away for free to local farmers. DC Harvest is a beautiful local restaurant on H Street, perfect for a business meeting or gathering for up to 60 guests. The family-owned restaurant specifically sources products from local farms and vendors, offering one of the freshest farm-to-table meals in the District. Set in historic Georgetown, the Four Seasons Hotel Washington, DC prides itself in its green initiatives, especially when booking events. Planners and attendees can “determine their shade of green” by choosing filtered water by the pitcher over plastic bottles, organic meal breaks and recycled notepads. The Forbes five-star hotel also gives attendees the option of adding extra plants for additional oxygenation and airport pickup via a hybrid sedan. The highly anticipated Eaton DC opening summer 2018 approaches sustainability from inside the hotel to the event spaces and beyond. Guestrooms feature natural and organic mattresses and bathroom amenities, while the rooftop houses an herb garden and wind turbine. The hotel employs an aerobic food waste decomposition system that eliminates food waste on-site. Ben’s Chili Bowl, located on U Street where some of mural artist Aniekan Udofia's beautiful alleyway murals live, runs on energy-efficient HPT8, reducing energy use by up to 50 percent in comparison to its original 60-year-old lighting. The Ben’s Chili Bowl location on H Street NE, which opened in 2015, also boasts efficient lighting, HVAC and Energy Star-certified appliances. Farmers Restaurant Group, the brand that runs Farmers & Distillers, Farmers Fishers Bakers and Founding Farmers, makes sustainability their mission and was named one of the “10 Most Sustainable Restaurants in America” by HuffPost. The brand has in-house recycling and composting programs that keep 90 percent of waste out of landfills and uses Energy Star qualified appliances and monitors, low-flow faucet aerators, refurbished-recycled materials in furniture and green cleaning products. The Walter E. Washington Convention Center is committed to reducing its carbon footprint and making a difference through its “Know the Code” color-coded recycling and waste minimization program. The program has helped the convention center take the lead on extensive recycling initiatives, along with its PepsiCo partnership that has installed “dream machines” surrounding the convention center to encourage beverage container recycling rates. Monumental Sports, the operator of Capital One Arena in Chinatown, recently embarked on a new solar project with OneEnergy Baker Point solar. Baker Point solar produces clean renewable energy for the arena, which is now operating using 25 percent solar energy. The 100 percent wind-powered Mandarin Oriental is a proud partner of the Anacostia River Keepers, who offer a series of volunteer cleanups removing thousands of pounds of trash a year from the Anacostia. 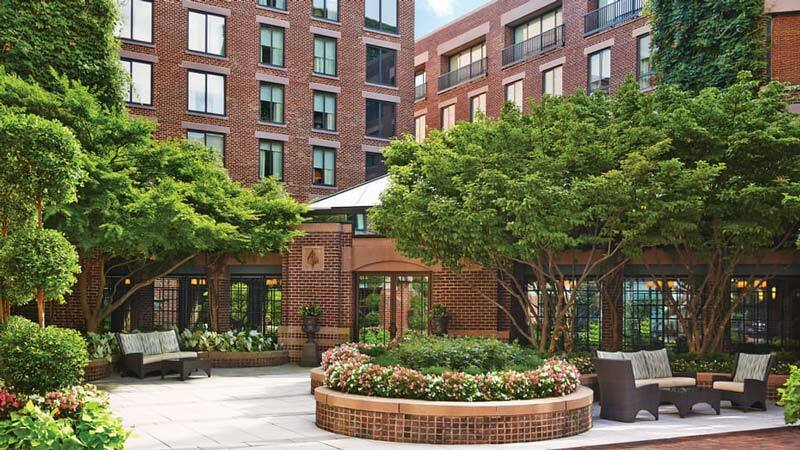 Mandarin Oriental also offers Anacostia River Keepers’ services to organizations that want to add sustainability and charity elements to their events. The new Wharf along the Southwest Waterfront has multiple green options. 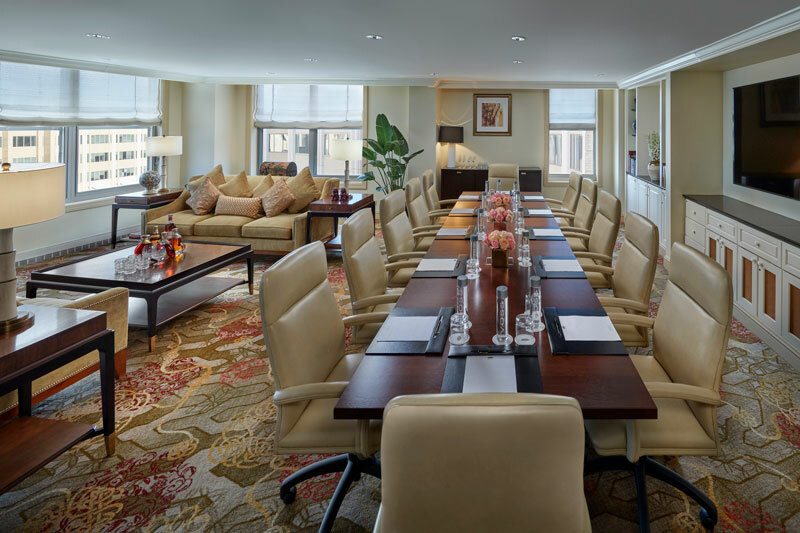 Choose from InterContinental Washington, DC - The Wharf or the dual-branded property featuring the Hyatt House and Canopy by Hilton, all of which offer a variety of sustainable meeting spaces with breathtaking waterfront views. Highlights of the development’s sustainability initiatives include more than 87 percent of material being diverted from landfill and disposal, flooring made from low VOC and hotel buildings comprised of recycled content. Audi Field is the new green home of Major League Soccer’s D.C. United. The 20,000-seat field, which opened in July 2018, is not only LEED Gold certified, but also a partner to Recycle Track Systems and New Columbia Solar. Recycle Track Systems is implementing food waste composting and staff training. There will be a short educational pregame video that is meant to teach fans how to recycle waste. In addition, solar panels in the venue are expected to offset the stadium’s electrical usage by one third. 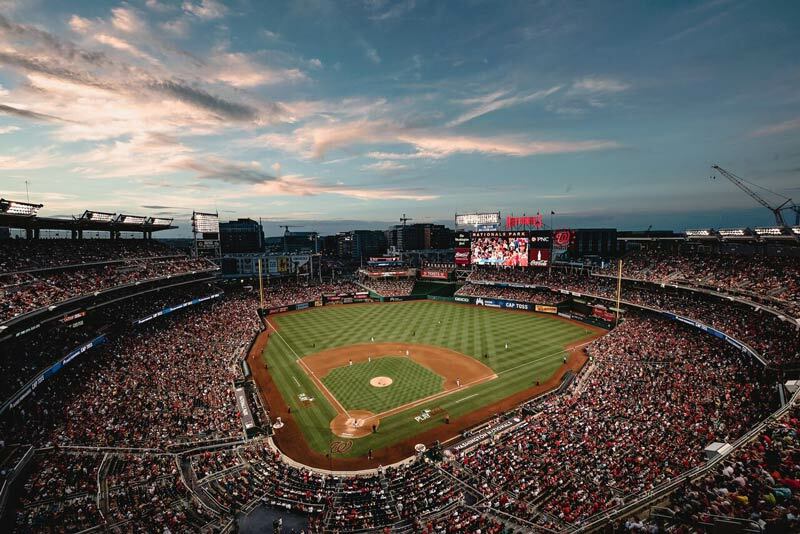 Nationals Park is the nation’s first major professional stadium to become LEED Silver-certified. The project incorporates a variety of sustainable design elements including a brownfield redevelopment that is located near the Anacostia River, energy conserving light fixtures and an intricate water filtration system. District Winery is DC’s first winery, boasting 17,000 sq. feet in Capitol Riverfront and overlooking the Anacostia River. The vibrant waterfront venue has LED lighting, energy-efficient equipment and a green roof for storm water control. The National Conference Center in Leesburg, Va. is Green Seal™ GS-33 Silver and Virginia Green™ certified. The National continues to host eco-friendly events and sustainable meetings, taking proactive measures to save energy. 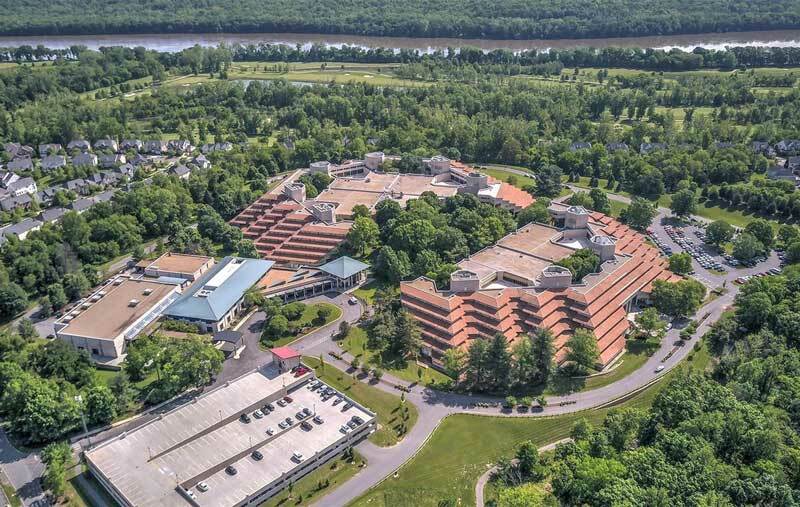 As a member of the International Association of Conference Centers (IACC) and the winner of the 2010 Loudon Country Green Business Challenge, it is no surprise that green initiatives are a priority for the National Conference Center, which boasts 250,000 square feet of meeting space and 250 meeting rooms. Lansdowne Resort and Spa is committed to protecting the environment and conserving natural resources, as a Virginia Green Lodging facility. The resort sports high-efficiency LED lighting in all guest rooms, restaurants and public areas; bee hives that support vital bee populations and a certified Monarch Butterfly way station to help bolster the population of local Monarch butterflies; and all restaurants are committed to purchasing fresh and sustainable foods grown locally. Continue your exploration of one of the healthiest, greenest and most livable cities and plan your next green meeting or event in Washington, DC.